Louise had been living with her partner Joe for 6 months. Joe worked as a builder. Joe’s ute got written off in a car accident. The ute was uninsured so Joe needed to buy a new ute to continue working. Joe and Louise went to the see a car dealer. Joe picked out a ute he thought would do the job. Joe sat down with the dealer to organise a loan to buy the ute. The dealer put some numbers into the computer. Finally, the dealer said the loan would not be approved without another borrower on the loan. Joe asked Louise to be on the loan as well. Joe told Louise he was desperate, he needs the ute to work, he would pay the loan and Louise would not need to pay anything. Louise said OK and gave her details and signed the loan documents. Louise and Joe broke up 6 months later. It is now 2 years later and Louise has been contacted about the loan by the finance company. Joe has disappeared, the ute has been repossessed and there is a shortfall of $5000 she needs to pay immediately. Louise is now being threatened with court action. Getting a loan with another person is a big responsibility. This is because almost all loans you get with someone else are joint loans. Joint loans can be a great way to purchase something (for example a car or a house) that you would not be able to afford by yourself. Joint loans can also be a nightmare where you have to repay a loan when you did not get little or anything out of it (like Louise above). A joint loan (or debt) is a loan that both you and the co-borrower or joint borrower have to pay. The co-borrower is the person you have borrowed the money with. A joint loan means that both of you owe all or the whole of the loan. To be a co-borrower or any kind of borrower you usually have to sign a loan contract. If you have not signed a loan contract and a lender is saying you owe a debt get legal advice straight away! WHAT QUESTIONS SHOULD YOU ASK YOURSELF BEFORE GOING CO-BORROWER? 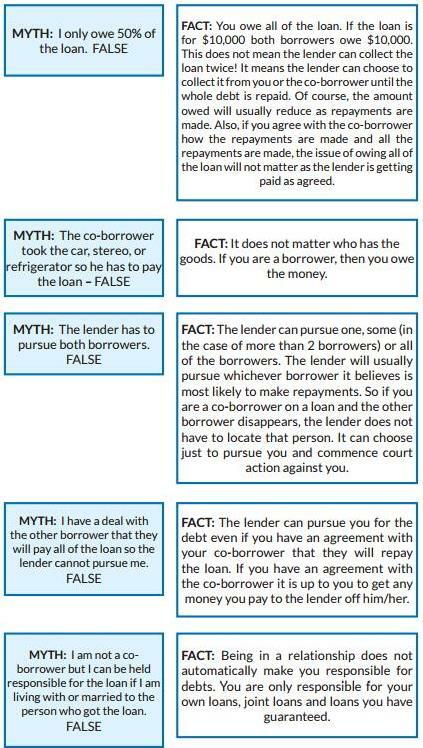 Also see Fact Sheet: Before You Borrow Money for other matters to consider when borrowing money. What am I getting out of this loan? Are you getting something out of the loan, for example, a car or a house? Is the car or house going to be owned jointly? If it is make sure this is recorded. If you are not going to get anything out of the loan then you should think seriously about not signing as a co-borrower. If you are at all unsure stop and think about it. Don’t sign until you are sure! CAN I AFFORD THE LOAN? This is where you consider the worst case. Could you afford to pay the loan if the co-borrower disappeared or became ill? This does not necessarily mean you should not sign but it is something you should think about. WHAT TYPE OF LOAN AM I GETTING INTO? Don’t rely on your co-borrower to tell you about the loan. Find out about the loan for yourself so that you understand what loan you are getting. Take care with line of credit loans! These are loans where you borrow money on a continuing basis up to a fixed limit. Examples are home equity loans (also called line of credit loans), and credit cards. For more information see Fact Sheet: Line of credit loans and home loans with redraw. You must receive your own copy of the loan contract before you sign the loan contract. Read the loan contract. You have the option of receiving your own statements to the address you specify or you and the co-borrower can sign a nomination form. This form allows you both to nominate one person to receive all statements and letters from the lender. If you decide to do this, make sure you remember to cancel this authority if your circumstances change.